Rip-roaring and rib-tickling, François Rabelais's irreverent story of the giant Gargantua, his giant son Pantagruel, and their companion Panurge is a classic of the written word. 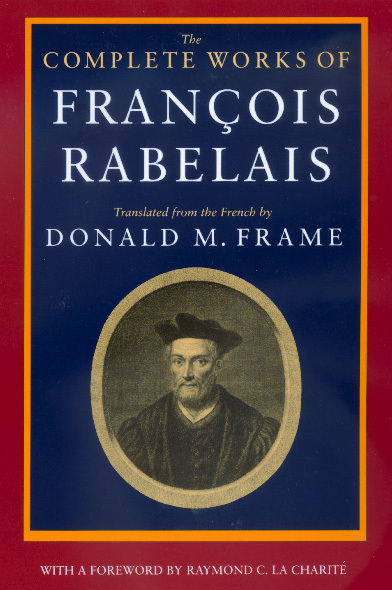 This complete translation by Donald Frame, helpfully annotated for the nonspecialist, is a masterpiece in its own right, bringing to twentieth-century English all the exuberance and invention of the original sixteenth-century French. A final part containing all the rest of Rabelais's known writings, including his letters, supplements the five books traditionally known as Gargantua and Pantagruel. This great comic narrative, written in hugely popular installments over more than two decades, was unsparingly satirical of scholarly pomposity and the many abuses of religious, legal, and political power. The books were condemned at various times by the Sorbonne and narrowly escaped being banned. Behind Rabelais's obvious pleasure in lampooning effete erudition and the excesses of society is the humanist's genuine love of knowledge and belief in the basic goodness of human nature. The bawdy wit and uninhibited zest for life that characterize his unlikely trio of travelers have delighted readers and inspired other writers ever since the exploits of Gargantua and Pantagruel first appeared. François Rabelais is known through his work more than through the details of his life, which are scanty. Born in the late fifteenth century, he first chose the monastic life, then left to become a lay priest and make a career as a physician, teacher, and writer. Donald M. Frame, (1911-1991) was Professor of French at Columbia University, and a renowned translator of, and expert on, Montaigne and Moliére as well as Rabelais. Raymond C. La Charité is Professor of French at the University of Kentucky and editor of French Forum and French Forum Monographs.